In the above diagram red nodes are from the division of the organisation under study; green and blue are from two other divisions and grey nodes are uncategorised or central functions. Timesheets: good but the system is not used universally as not everyone works on projects. 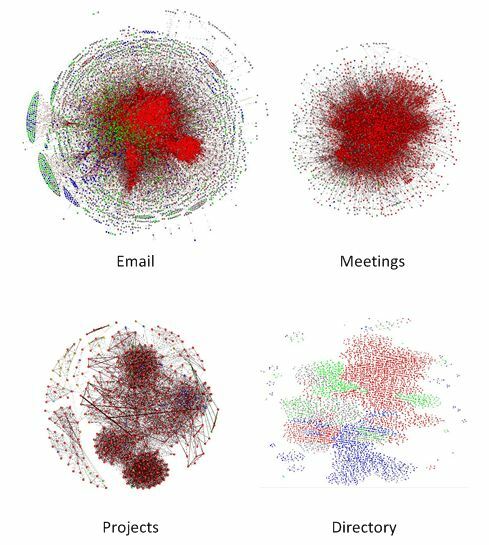 Email dominates the structure of the network, the others add very little for those in the core; however for those outside the core the others provide additional insight into the structure. There is overlap in these sources, for example we expect a manger will share emails with their reports and that people on a project will have meetings together but, as the coverage of each source is not compete, this is a small price to pay for seeing the whole network. Despite the rather simplistic approach the results appear to work quite well but I’d love to hear from anyone who has implemented, or read about, a smarter way to combine these types of SNA sources. This entry was posted in email, Social Network Analysis and tagged Combining Data, Corportae Directory, email, Meetings, Social Network Analysis, Timesheets, Weights on March 28, 2013 by Robert Gimeno.